Steel Storage Mezzanines have applications yet to be thought of. By utilizing vertical space with a steel mezzanine you can not only increase storage but also add office space or manufacturing space or even create a product display area. asy retrieval rather than paying to store them off-site. Visibility. 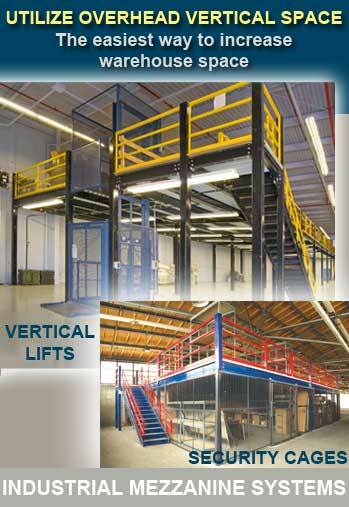 A UNARCO steel mezzanine or high tower can let you see operations from a birds eye view in any manufacturing facility. UNARCO offers a wide assortment of mezzanine floor and grating options for any upper deck requirement. It is easy to add gates and vertical lifts to any mezzanine design to make the top level more versatile. Special security gates and security wire can be added for secure mezzanine storage for tool and equipment lockup. We can also incorporate enclosed work areas specially designed to be free from the noise and dust of common warehouse operations. UNARCO’s team of engineers has designed thousands of multi-level product flow facilities and pick modules which include some of the most highly engineered steel mezzanine systems in America. The design and installation of Catwalks and conveyor support platforms in distribution centers is common place to our team of experienced engineers. Custom steel mezzanine designs are an easy fix to hundreds of applications for any budget allowance. UNARCO creativity can utilize every vertical inch of your warehouse. View more Steel Mezzanine Photos in the UNARCO Steel Mezzanine Photo Gallery.